What happens when memories are packed up in boxes? Paper Boxes is a short film that explores the notion of friendship, memories and growing up through the eyes of two best friends, just before one of them migrates to Australia. As they attempt to pack for the move, the girls have to discover for themselves if memories can indeed be packed up into boxes. We speak to the creators of this short film Melinda Tan and Jia Jian about their film and their thoughts on making this. SINdie: Yes boxes are indeed a repository for memories. What inspired you to choose this visual image for your film? Melinda: I have a box where I keep letters, cards and little gifts from friends over the years. As I went through the items one day, I was struck by the vividness of the memories that flooded my mind. These memories made me smile but were also tempered with a bittersweet sense of nostalgia, when I realised that I’ve lost contact with many of these childhood friends. As I spoke to more people, I found that many of them, like me, had a “box” (albeit in different forms) where they stored “memorabilia” from their childhood. This inspired me to write the script for Paper Boxes. Jian: For me, ever since I relocated to Singapore for my studies and now, work, I am constantly on the move, shifting in and out of hostel rooms and temporary apartments. Hence, the image of a packing box, which features prominently in the film, has an added poignancy for me, and was something I was able to identify with readily in the script. What do I take with me and what do I ultimately leave behind with each move? Memories exist in the things we choose to keep. What kind of memories are talking about here? Melinda: Memories of moments spent with friends, be it a long-forgotten adventure, a shared secret or joke, or even promises of staying “best friends forever”. When we look back at our youth with the lens of an adult, it is often these simple, seemingly uneventful lost moments, that make us ache a little inside. Many films are about friendship. What's special about this one? Why was it a film that needed to be made? Melinda: There are many stories told about friendship but the treatment for each of them is different. In Paper Boxes, Sabrina and Michelle are two best friends at a crossroad in their friendship. We wanted to capture a slice of that moment, with its underlying, unspoken mixed feelings of optimism and uncertainty. Being a character, rather than plot-driven film, our aim was for Paper Boxes to be a simple story, well-told. What were some of the things you learnt about friendship and memories as you made the film? Melinda: Working on the film made me reflect on the fragility of friendships. Sometimes, despite our best intentions to keep in touch, there comes a point where we may drift apart from certain friends, simply because our lives, goals and dreams have become so different as we grow up. Past shared memories alone cannot sustain a friendship. It requires the hard work of constantly creating new memories together. Jian: Agreed. What I found close to my heart for this shoot was actually the process of the whole production itself. 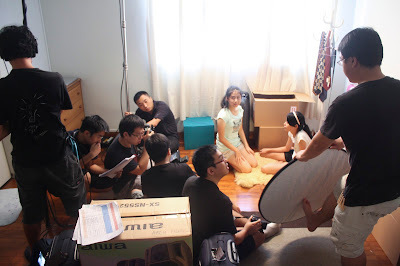 As much as we were encapsulating memories and friendships in a film, being on set with friends who are fellow nuSTUDIOS (a student film production house at the National University of Singapore Centre For the Arts) alumni, was in a way, a form of memory creation in itself. Similar to how many of us meet up for dinners with old schoolmates, this production was like a reunion "meal" for us. Anything interesting or amusing happened during the shoot? 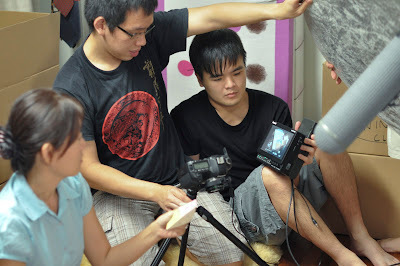 Jian: Another amusing incident was when we had a problem “taming” the hair of Foo Fang Rong, one of our actresses. She had a fringe which covered her eyes and we wanted to keep it up so that it wouldn’t be too distracting in the film. Unfortunately, it appeared resistant to any form of product. Our stylist Kate Lim used wax on it at first, but on close-up, we later discovered that we could see white bits of dried wax in her hair. Other products made her fringe clump up, falling unnaturally. We ended up having to wash the products out of her hair and restyling it before each shot. Melinda: Paper Boxes was our first independently-produced short film. So while our previous films produced under nuSTUDIOS received funding from the NUS Centre For the Arts, this film was completely self-funded. 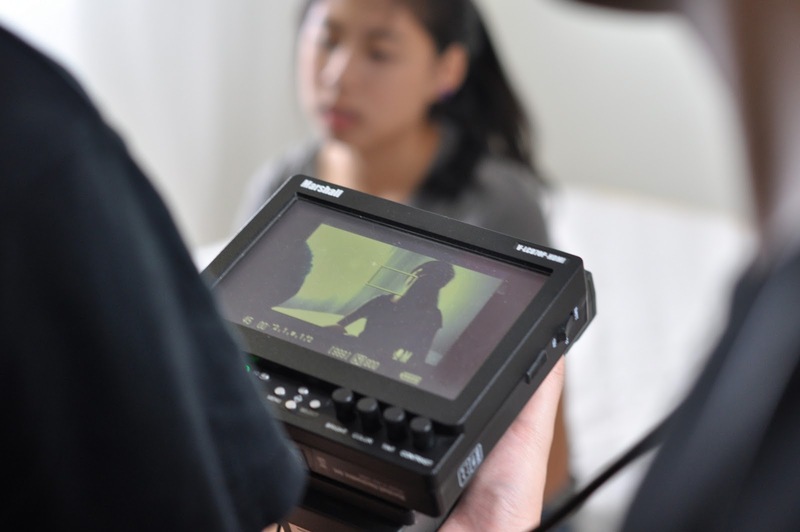 Despite the limitations in our budget, we were adamant that production values of the film would not be compromised. As such, we had to be very strategic with how we spent our funds. Thankfully, we had such immense support from the people around us. We managed to borrow a camera and some equipment from friends, had relatives who allowed us to shoot in their house, and very talented friends who believed enough in us and the project to crew for us. 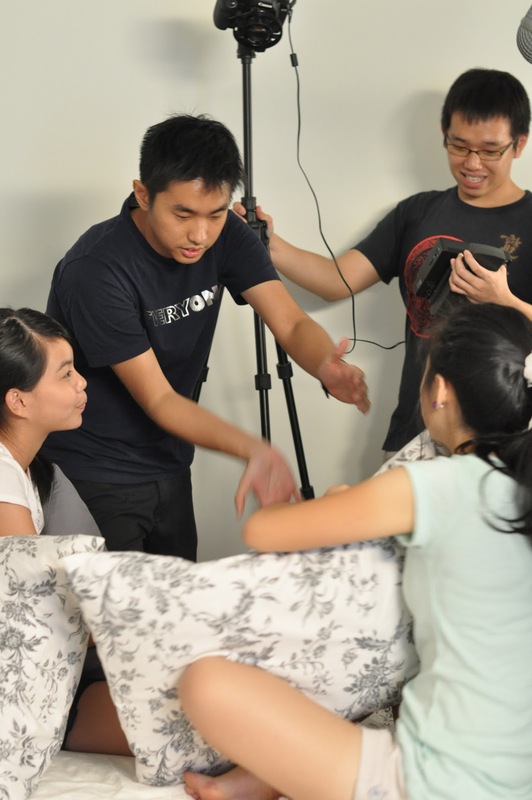 We were also given much support from nuSTUDIOS, which also had some of their committee members on our set as crew. It was a very humbling experience, and we owe them all a debt of thanks. Jian: Our other big challenge was having to work around our crew’s full-time day jobs and conflicting schedules to make this film. In order to minimize the demands on cast and crew’s time, we made the decision to complete principal filming for the film within one weekend, which as you can imagine, meant much stress and very little sleep for the both of us in the weeks leading up to shoot. We took 6 months to develop the script, and another 6 months for pre-production. Post-production, which involved editing sessions that commenced at the end of our work day till midnight, took us another year. Our editor, Derek Tan, travels a lot for work, so editing sessions had to be arranged around those periods. Looking back, pulling through late nights with work the next day was exhausting, but it was definitely worth it. What's your personal favourite scene in the film? Why? Melinda and Jian: We will cheat a little and say we love the last two scenes best (but no spoilers here). We were moved by the performances of the three actresses, Kelly Lim, Foo Fang Rong and Victoria Chen. They captured the emotions needed in the the scene(s) beautifully. To stay in touch with this film and know where you can catch it, check out its Facebook Page here.